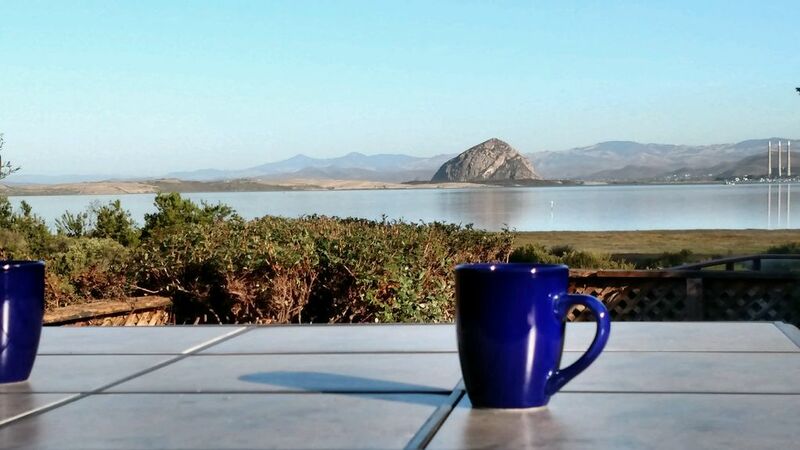 Sweeping views of Morro Bay and the Rock from the deck and hot tub. Steps to the spectacular estuary preserve. This spacious 2 bedroom home is surrounded by the estuary and 24 acre Sweet Springs Preserve. Walk around the Bay to Baywood for a spectacular sunrise or sunset. 4 miles from Montana De Oro with sweeping vistas, horseback riders, hang gliders and surfers play on its miles of beaches and trails. There is so much to do for those who appreciate the unexploited California Coastal experience. Travel by Kayak across the Bay to the Dunes. The home has been recently redecorated and updated, but not remodeled. The cabinets are oak and the counter tops are tiled. If you are looking for high end modern, this would not be the place. Los Osos is on the Central Coast of California - halfway between San Francisco and Los Angeles. Hearst Castle, Morro Bay Harbor, Avila Hot Springs, Wine Tasting, Golfing and Shopping are minutes away. This house is ten minutes from San Luis Obispo Airport. Family-owned and operated. Well behaved dogs considered with pre-screening and deposit! (No Cats)Your dogs will love the fenced yard and the walks on leash. Dogs cannot be left alone in the house or yard. I recently moved to Seattle to greener semi-retirement. I can still answer some of your questions, and will refer others to my daughter Kye who manages the property for me. Please call me if you have any questions and tell me how I can make your stay more enjoyable. She works 8-5 so please call Jean during business hours. Unspoiled California as it once was. You are surrounded by natural beauty. Spectacular views--you can reach out and feel the estuary on all sides. This location is a one in a million. As you drift off to sleep, often you might hear a dull roar. You would think it was the sound of the freeway--but it is the sound of the surf. We encourage you to soak in the natural beauty and wonder of this very special hideaway. Walk to breakfast in Baywood. Dogs are welcome on the patio of the Back Bay Cafe. This is the most dog friendly village you can imagine. Monday night live music in Baywood year round. From the elevated deck you can see the Bay and Morro Bay sand spit which is a preserve for nesting birds. Sweeping views of Morro Rock, Morro Bay, and Morro dunes from the back yard and new deck. All above linens are provided. You will find the beds made when you arrive. The washer and dryer are not shared with others. As a condition of our permit, off street parking in front of the garage and along the dead end street. Please use park off the street always. There is a garage where we store 3 kayaks. You may use the kayaks but they must be returned to the garage in the same condition. 2 new comfy cozy couches to curl up on. Add lemon fresh to accommodate for the hard water. Coffee, tea, oil, salt and pepper, spices, paper towels, etc. Full set of pots and pans--newly stocked. Dishes to accommodate 6. Hot tub is accessible from master bedroom. Star gazing or coffee at dawn is highly recommended. There are so few lights you can see the milky way. Don't miss the fabulous birding opportunities just steps from your door. Well-equipped and comfortable house; quiet too. Dog-friendly. Great view of Morro Rock and Bay from the backyard. Adjacent to the local bird sanctuary. We’d happily return. Great house. Well equipped beautiful view and the hot tub is wonderful. Very sorry to leave! The house was very clean, and just as described. It had everything we needed, and was in a nice and quiet location. The property is in walking distance to a wildlife and bird sanctuary and was very quiet with a view of the ROCK. Also a fenced in back yard which is great if bringing a dog. The house was well equipped with big bedrooms and comfortable beds; Overall a very nice rental. Perfect place to stay that is either walking or driving distance to restaurants and attractions in the area. Very quiet and comfortable. Homey, perfect size for us, quiet. Perfect spot for a relaxing getaway. Steps from the Sweet Springs Nature preserve. A few blocks away from Elfin Forest preserve. Montana De Oro is a must see just 2 miles away. Sweeping vistas of wild unspoiled rocky California Coast. Whale watching in Morro Bay by boat or off the coast from Montana De Oro, with miles of beaches and trails. July 2011 has seen blue whales and hump back whales in abundance just off shore. Bird watching in the winter is spectacular from the deck, or from Sweet Springs preserve just steps away. You will be sent the code information to unlock the house a few days before arrival. Any questions, you can call Kye.